It is virtually impossible to get through a week at college without at least one party so it's inevitable that you will be hosting a few of your own. 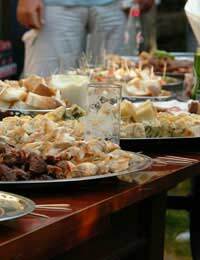 While most of these will probably be impromptu gatherings or all-night bashes where the beer is much more prevalent than the food, there will come a time when you fancy adding a few choice nibbles to the evening's proceedings and turning the event into something a little more sophisticated. It's a good idea to place a few bowls of crisps and nuts or olives around the main room so that people have something to take the edge off their appetite while you're preparing the food. You don't need to get carried away; a couple of varieties of snacks should be adequate and you should choose things that are quick and easy to prepare so that you can spend most of the evening with your guests and not in the kitchen. Simply wash a bag of baby new potatoes and par boil in a large pan for about 5 minutes. Meanwhile, preheat the oven to hot and preheat a baking tray with a drizzle of oil. Drain the potatoes and spread over the tray, coating them in the oil. Cook for about 20-30 minutes, until they have turned golden. Place in a serving dish and spoon over a little green pesto. Give your guests cocktail sticks to eat them. These look and taste great and you can choose any combination of ingredients that you fancy. Peppers, mushrooms, courgettes and red onion work particularly well and all you need to do is chop them into bite-sized pieces and sauté in a large pan, in a little olive oil. Thread a selection of the ingredients onto cocktail sticks and serve with some minted yogurt for dipping. You can buy mini bagels in most supermarkets now and they make a great party snack. Slice the bagels then spread with some cream cheese and top this with a slice of smoked salmon. For a sophisticated finishing touch, squeeze a little lemon juice over and add some freshly ground black pepper. 1 can of chopped tomatoes cooked over a medium heat with 1 crushed garlic clove and some freshly chopped basil. Sprinkle a little extra basil over the bruschetta just before serving. Spread 1 teaspoon of green or red pesto on each piece of bread then place a thin slice of goats' cheese on top - finish under the grill for 1-2 mins, until the cheese begins to melt. Keep it simple and authentic by rubbing a clove of garlic over the toasted bread, followed by fresh tomatoes, cut in half. This is a quick and easy way to provide your guests with something to soak up the alcohol. Chop up some celery, carrots, peppers, broccoli and cucumber and arrange on a large serving platter. Mix some very finely chopped cucumber and mint into a tub of natural Greek yogurt and serve this as a dip. With a selection of these to offer your guests, you should have a successful party in the making. Don't prepare too much food in advance and try to just bring out one plate of snacks at a time - you don't want to end up with a fridge full of chopped carrots!